Having booked the Amari Boulevard sometime ago it was full by the time I checked in. On this occasion, it was to my advantage as I was upgraded to a Suite which was breathtaking to walk into and think this was where I would be for the next three nights was most appreciated. Being ‘holed up’ for a couple of days trying to finish a Uni assignment wasn’t a problem as ‘staying in’ meant feeling relaxed and at ease whilst trying to meet a fast-closing deadline. The very comfortable lounge already with a TV adjoined the bedroom, and in it, another entertainment unit which made you feel really spoilt. In the far corners of the room, there’s a sloping pyramid annexe on two sides which skirt around the edges, this is enhanced by complementary layered blinds to suit the unusual design. This in turn gave a plush feel whilst retaining the floor space. The sun setting in the afternoon imbued the whole area a soft hue which lasted till late and made a pleasant retreat by late evening. The bathroom was the size I could only dream about having at home, with a deep tub to soak in (a rarity in Asia these days – I think anyway), and a separate rain shower which made it effortless in readying yourself for an outing. This is an extremely busy hotel in an equally frantic area. The Bumrungrad International Hospital is nearby, therefore making this hotel a magnet for guests who maybe want a longer stay. The obvious multi-cultural guest mix coming through makes it worthy of having a coffee in the foyer and casually watching a lively array of people come and go. Due to the fact there is such a diversity of cultures, you can be sure the breakfast buffet caters for all tastes; allowing you the opportunity to explore a variation away from the normal obligatory greasy bacon and eggs most others provide. My advice – take a little bit of what you think you’d like and then go back for the really yummy offerings of which you’ve taste tested and don’t easily find at home. Best of all though, plenty of healthy choices for those who are constantly trying to disband a few kilos. Big tick of approval from me! I was fortunate enough to have The Manager Mr Alexandre Frenkel meet me in the afternoon to view some of the other room types. I found there was a great range to suit most budgets whilst maintaining high standards to meet the guest’s needs. Particular to note there are 123 rooms with a balcony view – large enough to host a small gathering, especially for a family who wish to keep it personal and private. I’m not aware of too many hotels in Bangkok which could offer an area as quite spacious in this area. The hotel is incredibly close to Nana Station as it’s just around the corner which makes it even more desirable due to its location, shopping and entertainment. The first station for the Sky Train is a few stops away from Nana and then takes approximately twenty minutes duration to the airport cutting through the traffic which we know to be horrendous at any time of the day in Bangkok. I would most definitely stay at the Amari Boulevard again as they understand and know their market well and cater accordingly; they include all the facilities and amenities you’d expect of a large hotel and seem to employ very knowledgeable and well-spoken multilingual staff who provide fabulous customer service. When I left the Amari Watergate in Bangkok last year I was determined to stay at another Amari property and Hua Hin was on my ‘To-Do List’. Having caught a bus which connected at Bangkok’s Suvarnabhumi Airport from Pattaya, it was an easy two hours one way from there onwards. As we drove past all the other major players in the Hotel Industry (as I am a member of a few), I decided this time to go with my previous decision and the fact I liked the location of the Amari property. When we pulled up, and looking from the outset, I was not so sure as the exterior really belies this resort … However, any qualms were quickly relieved as it was apparent the Reception and interior was really aesthetically appealing to the eye, immediately I knew this was a fabulous choice. Large Mykonos-like-blue shutters give an immediate feel of “I’m now on holiday and let’s relax quickly with a cocktail.” The Coral Lounge at the front of Reception captures the essence of Hua Hin’s colonial history and guests appeared to be enjoying themselves whilst sipping their drinks and playing games. This is a fresh property of two years and the smell of newness is still there. I was quickly shown to my pool-view room by a Hostess. 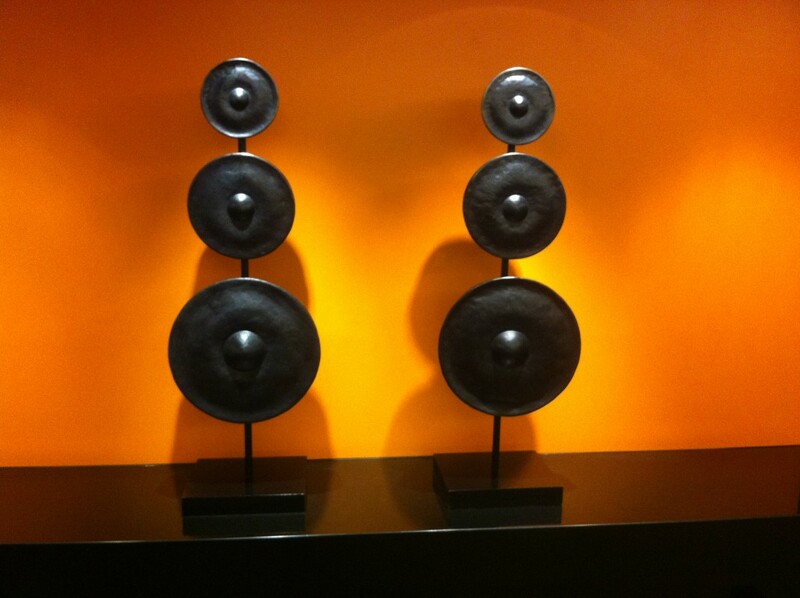 It’s contemporary in design and the decor entices you to feel at home. Large walk-in rain shower with excellent lighting over a wide bench space for all those girly accessories and make-up is always a relief. And when you’ve finished powdering yourself, a fresh brewed coffee from the quaint cabinet with flip-down side is perfect, then grab a three-sided mug that actually allows your snout to fit into it – then take it, sit back and enjoy the plush lounge or balcony area. My room ticked all the boxes as far as a looking at the extensive pool with those huge bamboo sticks spilling out water hard and fast on the back of your neck; pounding down on those sore spots – ohh miss that very much. Funky music can be heard around the pool area and I swear those ferns were dancing along with it, or maybe it was the couple of cocktails from the Reef Deli and Wine Lounge I had … But if you happen to be around there for lunch, I recommend the Spicy Fish with Vegetables – yummy – very filling and healthy; eat it later in the day because breakfast has so many delectable offerings to keep you going till then. Mention free wifi to an Aussie or Kiwi and that’s already a saving we love to have included. And to prove how modern the resort is, no need for me to call Reception for an adaptor (of which I’d forgotten), there was already an international one built into the bench space. Ticking more boxes is the enormous full-sized wall mirror at the entrance for all those who can’t see enough of themselves; fabulous for those last-minute peeks of yourself before heading off to the Shoreline Beach Club (Restaurant), right on the sea side, which also belongs to the Amari. Ok, so you have to trot down the side of the Residences to get there, but how about the scene when you arrive and are seated by the ever-pleasing staff! Go early as you’ll secure a view over the Bay and watch the squid-fetching men in their boats with the green lights for attracting them – very picturesque and have a good camera when you go. Try some of the local vino as there was a Rose which was crispy, easy drinking and went superbly with the delicious spicy seafood we had. See there is a reason I go to Thailand every year! The Amari has one Conference facility which can comfortably fit 200 guests for a sit-down dinner and dancing. The other function area is a bit hipper and slightly away from the main building which would be beneficial for others who wish to party – no doubt it would suit smaller groups comfortably. And what can I say about the staff? They are immaculate and Management must have an eagle eye for people who take pride in their appearance and the work they do. The ladies are groomed and coiffed to perfection (just like Japan Airlines crew) and the men are superbly dressed and very handsome too. Amari Hua Hin is a definite when it comes to relaxation and just having that good-old fashioned manner in doing the right thing by its guests. 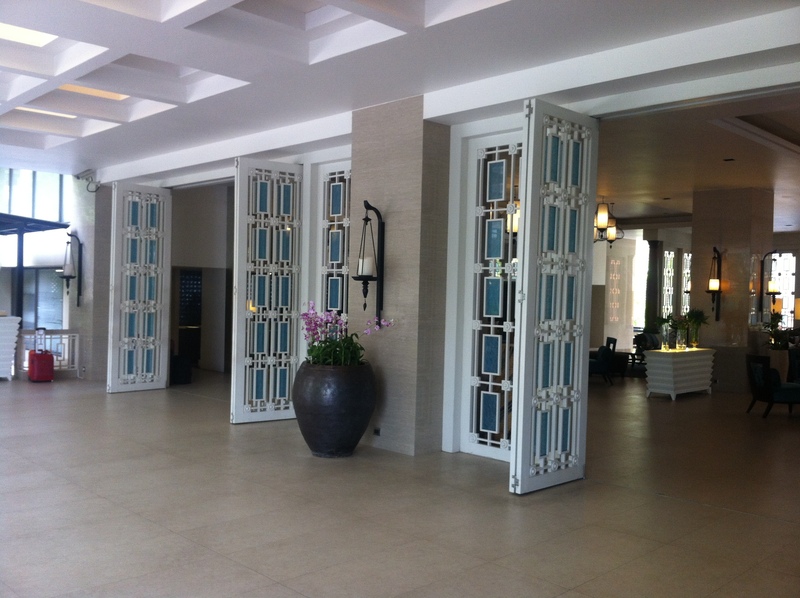 Amari Hua Hin, please give yourselves a clap! Room Tip: Try to book mid week as the rates are somewhat cheaper as the locals flock to the Amari on weekends. I didn’t have a lot of time to research Pattaya, but very glad I had the opportunity to stay at The Bayview Resort. Such a treat when you walk into the foyer of this charming open space and be greeted with a cool towel and drink by the smiling staff. Looking around at the crystal-look blue glass inserts, they compliment the large candle bra hanging from the ceiling which makes it feel cool yet warm and inviting. Once I was shown to my room I knew I would love it as the outlook was over the Bay and the sunsets were absolutely magnificent. Very relaxing watching all the fishing vessels out at sea going about their daily routine of keeping Pattaya’s fresh seafood in stock. Next day the Para gliders were even more entertaining as the sky from my room’s view was filled with floating colours. I’ve been told the rooms on the sea-view side are slightly smaller and as a lovely Kiwi couple I’d met said they opted for the city view as the rooms were a bit larger. This couple had been coming to The Bayview for about 4-5 years and another couple from Adelaide had been coming for more than 20 years! Now if that’s not a recommendation I don’t know what is? However, I was truly satisfied with my lovely cosy room with beautiful oriental décor with a chaise lounge and of course … free wifi. Something else which is fantastic about this hotel is the fact it has a long drive way leading up to Reception from the busy street and at the frontage – being the sea side; there is the Wave Hotel (which I believe is owned by the same group – Sukosol), therefore making this hotel very quiet considering there’s some much activity going on around all sides of it. And yes, you can see over the hotel with a view of the sea and pool. If you think Phuket is a myriad of food, culture, bathers and lots of Aussies having a good time, then I recommend Pattaya and The Bayview Resort for a welcome change. You can fly from Phuket to Pattaya with Bangkok Airways and my fare one way was approximately A$90.00 inclusive and the shared bus from U-Tapao Rayong-Pattaya International Airport was TH250 to your hotel. This is about a one hour drive. However, there’s a bus that runs from Pattaya to Bangkok Suvarnabhumi airport and vice verse with a regular timetable of 2 or 3 hours apart during the day time. The bus line I used was Bell Travel Service and at Bangkok Airport it’s located on the Ground Level – fare is about TH250 if I remember or you can hire a taxi for about A$50.00 I’ve been told. 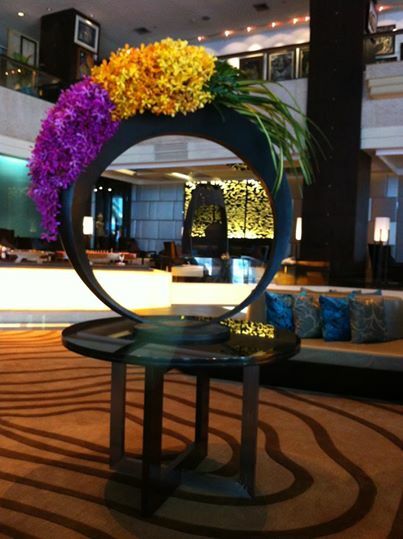 When you first enter into the spacious foyer of the Amari Watergate Hotel in Bangkok, it makes a welcome relief from the crazed masses of shoppers in the Prutunam shopping precinct. It’s simply elegant and slick. If you’d made a faux pas and said Armani then you may be forgiven as the Amari also exudes style in its own right. When I checked in the staff were having some banter amongst themselves which was refreshing to see. As my room wasn’t quite ready, I was quickly offered a coffee voucher to make use at the lovely café whilst waiting. Not too long after connecting to the free wifi, a room key was brought over and I was pleasantly surprised to have a room which was spacious and ‘a la naturale’ light which meant no walking around turning on lights during daylight hours. I was able to find easily which switch operates which light as there were no fancy electronics to figure out here. Blonde-coloured furnishings may not be to everyone’s taste, but it added extra brightness to the room which in turn felt incredibly cool – even when the air conditioner wasn’t turned on. Huge bathroom and separate rain shower makes women very happy indeed. The deluxe room is the lead-in category and it’s easy to see why Australians are fond of the Amari as the colours are deep earthy tones and warm – just like the outback. Sufficient bench space and free wifi in the rooms add significance to those who need internet access. I noticed the casing of the window in my room was about 12 inches in from the walls, floor and ceiling. Why is that important you might ask? It means the curtains actually hide out the light from above the pelmet and below the hem, allowing it to be totally devil dark which in turn is heaven sent to anyone with light-sensitive eyes. Cabin crew friends talk about curtains that never close properly and we know what odd hours they must try to sleep. At least this property ‘got it right’ – and that was almost 20 years ago … shame a few more properties didn’t take notice. I had the chance to view the conference rooms and banqueting facilities capable of seating up to 1,200 guests. Again large light rooms with huge communal tables in the break-out areas gave an impression of professionalism throughout whilst retaining an air of informality. The pool area is on level 8 where you can relax away from the buzz of Bangkok, however I might have thought during peak season it would be a frantic dash to secure your spot by the water. Throughout my stay, the staff members certainly ensured the service standards were above what’s expected and they strived hard to keep it that way I felt. I had the opportunity to experience the Executive Lounge for breakfast and again the evening’s delectable cuisine. All prepared by the Head Chef who also carved the mouth-watering roast for guests who circled around him like a hyena. The desserts were just lip smacking and beautifully prepared. And again, the staff members could not have been more helpful and chatty. I was sad to leave the Amari Watergate and looking back from the Sky Train, I tend to think the stand-alone property may have been the first built in the area. I figure they must have thought ‘build it and they will come’ and tourists certainly have been for years now. There’s a plethora of shopping plazas and street stalls around and doesn’t matter which direction you walk. Speaking of the Amari group, there is a property at Hua Hin of which I’ve earmarked for my next trip … if Hua Hin is good enough for the King to take up residence then I feel it’s worthy a visit. Not to mention, each September there is an annual elephant polo event which sounds like fun! Hint: Upgrade to the Executive room as you’ll have access to the Lounge and truly worth the extra dollars. V is for Vijitt and V is for Victory. And I have to say, The Vijitt Resort on Friendship Beach Ruwai, Phuket is victorious when it comes to fending off its rivals in the stakes for exclusiveness and sophistication. The Villas have an indomitable presence in the big world of resorts undoubtedly, as the founding family in my mind, have not spared any comfort they would not afford themselves whilst taking some time off. The 92 Thai Villas are brilliant white which in turn accentuates the colour scheme of the building’s trimmings and natural-surrounding foliage. The manicured gardens and undulating landscape add extra appeal to an already exotic look and feel. When walking towards the beach area, there’s no escaping those propped ruby-red umbrellas overlooking the sea with its infinity pool in the forefront we see in those glossy magazines – upon first sight, there was a realisation this view truly does exist. As a non-swimmer (some of the time) I noticed each day how calm the sea was in Chalong Bay which I’d imagine would be a relief to anyone with small children. My rating -good enough to live in – and would love to. The Vijitt has upped the ante for any nearby contenders when it comes to facilities and service. The bedroom/living area had a full-length work surface directly behind the bed head which allowed me to work whilst having an external outside view, or watch the full-screen TV and not compromise any floor space. There was a separate dressing and bath area with the rain shower outside giving a sense of freedom with privacy. My only concern being so tall was the down lights in the bathroom were a little too low for me and not quite bright enough. I’m being nitpicky but that’s my personal opinion. There was a free shuttle service at varying times and the choices were Nai Harn Beach, Coral Island, Central Festival Phuket Town or Patong with a timed return service each day. Breakfast was well catered for with coffee being brought to the table occasioning a smart casual café feel whilst overlooking the Bay. I like how the hot food bar had clear glass lids so you can see what’s inside without having to keep opening each one before making a decision of what to eat. The staff in all areas of the property can converse on many levels with overseas guests as they try very hard to please wherever possible. At all times I was made to feel welcome and without doubt worthy of a return visit. The Sala Resort and Spa is a harbinger – a style of its own. I might not have thought so when I first saw it from the outset last year when I was walking along the beach at Mai Khao, Phuket Thailand. It appeared segregated into its own high-walled exteriors and left me wondering what it could possibly be like? This year I stayed at the Sala and once inside this enclosure, I can assure you Cleopatra would not have been disappointed. Within The Sala’s luxury villas, guests can swim in their very own private pool without having to venture out. Adding another level of chic sophistication; an outside gigantic scalloped mirror reflects the calm water, tear-dropped, chandelier-like light fittings which hang charmingly, a deep elongated bathtub, along with the lush furniture and comfy pillows, are all located under a protected area overlooking the pool. Under the mirror is the bathroom vanity with a double basin which had more than enough space for all those girly amenities – usually flung around like there’s no leaving the place soon. As for the outdoor shower, there’s something quite exhilarating about having a warm ‘rain shower’ whilst it’s actually raining. Within the living area, the décor is very easy on the eye with delightful hues of mauve and purple in the closet areas which contain a scarf and umbrellas. The space to make a coffee/tea or any other preparation can be hidden by sliding doors, which can also hide your luggage. My only disquiet was if you wanted to fill the coffee plunger/tea pot or have the need for any water, you would need to walk outside to the bathroom basin. No big deal – just thought it worth a mention from someone who always enjoys a constant cuppa. 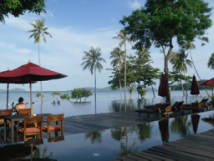 Breakfast is definitely worth a mention as it’s served in the main beach-side restaurant overlooking Phang Nga Bay. From the menu you can choose your meal which is cooked to your liking. All the other accompaniments are within easy reach as buffet style with fruit, toast, bakery goodies and an assortment of dishes to suit various cultures’ tastes. Leaving was difficult and whilst waiting for the taxi, one young staff member I spoke to assured me my taxi was coming. He said the Resort takes pride in its staff and he was learning (through his employer) to speak English and improve his job opportunities with them. I thought this was quite admirable and the service here is second to none with young bright people at the helm. The Sala is located approximately twenty minutes north of Phuket airport and the taxi ride is around Baht 500 each way (aprox A$18.00 on today’s exchange rate). Estate agents talk about location, location – the Centara Karon Resort Phuket has exactly that. Just walk out the front security gate and you’re in the midst of everything – from a host of relaxing massage shops to an Irish Pub – you could almost stumble from one to other, just depends on which you go to first. At The Centara Karon, I’d asked for a quiet room and it was indeed, being one of the farthest rooms away from the Reception; however after walking across the spacious, beautifully-kept gardens and pool areas I didn’t mind at all. Even better, it was closer to the Tropical Club Lounge whereby Afternoon Tea was being served for an hour to guests who held the appropriate entry card with their room category. There were sufficient sandwiches and cakes for all which were deliciously fresh. Great coffee, even though an auto machine was used it made the grade. Afterwards a return entry at 5:30 to 7:00 pm allowed you canapés, beer, spirits, wine or soft drinks with no frowning upon some of us who were a little thirstier than others. Across the courtyard in the Lotus Restaurant, the Buffet of the night was Wok on Fire and a feast of course. 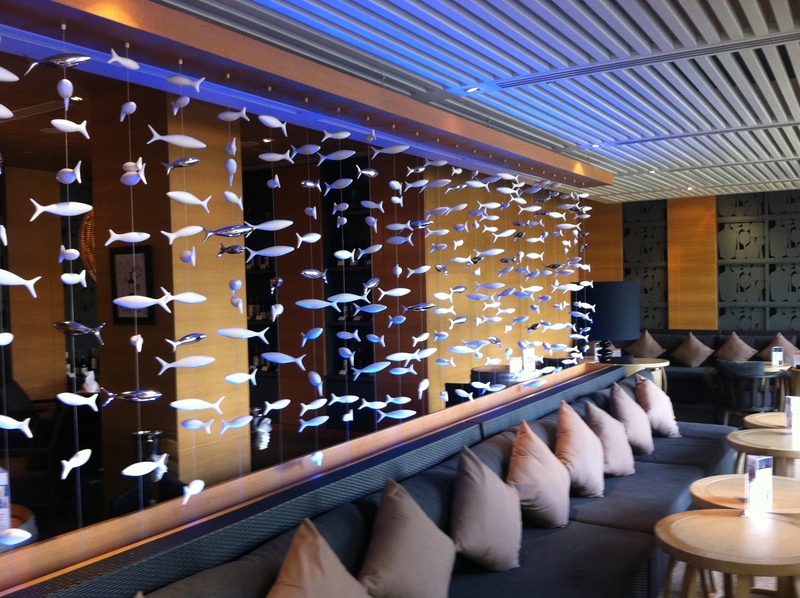 At BHT350 plus tax (appox A$15) – it was a foodie experience not to be missed. Upon returning to my room in the evening the staff and Manager organised a card and ‘Happy Birthday’ which was carefully placed on my bed with lovely pink petals and foliage. A really nice touch and one I’ll remember. Thank you Centara Karon Beach Resort. The Sands by Katathani Resorts is relative newcomer in Khao Lak and only opened for business in December 2012. Inspired by the natural surroundings of Nang Thong beach and lush leafy vegetation, this property radiates relaxation. Its driveway is approximately 100 metres long and off the main road making it an easy walk to access local shops and food venues. Either side of the property, a patrol checks for in-house guests; ensuring there are no unwarranted visitors using it as a thoroughfare either. Within the property, The Sands room is the lead-in category and at a spacious 45 sq m is well suited for couples. The Family rooms can comfortably accommodate two adults and two children (provided one is under age of four years) – it evokes an underwater world theme which is a favourite amongst little ones. A sliding door allows a flow-through breeze giving some privacy and the ability to keep an eye on the kids (or they you?). There are interconnecting rooms as well for larger family members. Also, families can enjoy its dedicated Kid’s Club and abundant daily activities for adults including a language class, Thai boxing, yoga, nature walk and more. The vegetable carving and cooking classes do attract a fee. None of the rooms have a full-ocean view however a partial-ocean outlook is possible as the property’s rear end faces the beach, giving the ability to see the sun set and waves coming in at an angled view. Rain showers are the norm of each room and the Sea Suites offer one or two-bedrooms and are in the vicinity of 100 sq m with a jacuzzi and grand balcony. None of the fridges are stocked with mini-bar goodies – a relief for someone like me who would prefer to just purchase what I need without having a staff member constantly checking the inventory of what’s been used – or more often – not used. There’s a swim-up bar for those thirsty Aussies and Europeans and you’ll notice whilst floating around signs asking to be quiet, otherwise you might have to join the kids down at their pool with their parents. The position of the lagoon is the central focus within the property and fish feeding occurs twice a day outside the Floating Market restaurant. The Sands is considered a 4.5 star property offering a turn-down service in the evening regardless of room type and is a welcome touch when returning from dinner.